Many people consider De Nederlandsche Bank (DNB) Head Office at Frederiksplein to rank among the ugliest buildings in Amsterdam. De Nederlandsche Bank is located where the Paleis voor Volksvlijt (Palace for National Industry) went up in flames in 1929. Some call for the De Nederlandsche Bank to be demolished in favour of rebuilding the Paleis voor Volksvlijt. Demolishing De Nederlandsche Bank, however, would imply the permanent loss of an intriguing artwork to the Amsterdam street scene. The fence around the plinth of De Nederlandsche Bank continues to create a true optical experience. 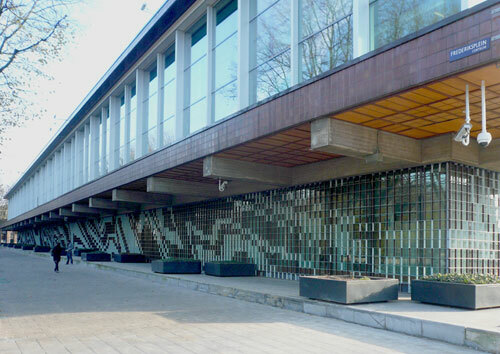 While passing the building, a rhythmic, dynamic pattern appears in the trellis of the fence. The figures on the sides of the rails were designed in 1992 by the artist Peter Struycken, a pioneer in the field of environmental art and in generating computer-program based image, light and colour compositions. Whether or not you like the building, the presence of this unique artwork might be a valid reason to plead - instead of 'DNB must not be' - for the retention of De Nederlandsche Bank and to refrain from reconstruction of the Paleis voor Volksvlijt. Click here for text 'Instead Of 'DNB Must Not Be', as PDF. Related: 'Exit Struycken? ', Domeniek Ruyters, metropolism.com, 22/06/2017.